Partial or whole-body scan is an excellent tool in sports medicine and pain management both for men and women. It provides a visual means of identifying areas of inflammation and abnormality and helps determine where your pain is coming from. It may also be used as a gauge to assess pain management progress and treatment response. Preventing Heart Disease: Thermography can also be a valuable early-warning indicator of heart disease, notably atherosclerosis, before it produces a devastating heart attack or stroke. 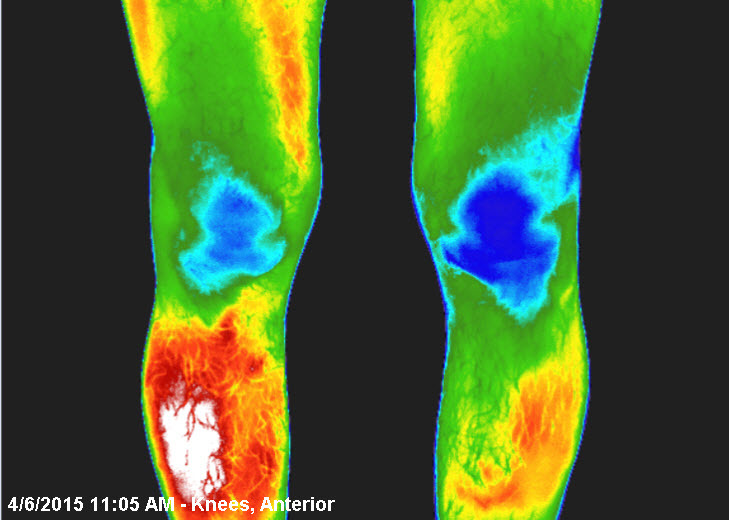 A thermal image shows the areas of blood flow and you can compare the differences in heat emission and circulatory quality on one side of the body against the other. Any disturbances or deviations would indicate something is abnormal. When there is a restriction of an artery, often time it is due to atherosclerosis. Thermal imaging helps you see the evidence of restriction of blood flow in specific narrowed arteries along the course. In this way, you can learn that a disease process is underway, and take corrective action before it is too late. Pain Management: Chronic pain and its cause is one of the most difficult diagnostic problems plaguing physicians. Frequently patient’s tests do not correlate with their symptoms. While other physiologic tests exist they do not monitor the pathways in the same fashion as thermal imaging. Pain felt at the area of injury is generally seen to be hyperthermic (increased thermal emission). Areas of referred pain are generally seen to be hypothermic. By utilizing thermal imaging more information becomes available to assist physicians/chiropractors/therapists in the treatment of chronic pain related problems. Also, early detection of arthritis can allow physicians to address and prevent the root cause of joint damage, deformity, and disability that often arise as a result of the condition. In short, thermography is a great tool to help monitor and improve your health and wellness.